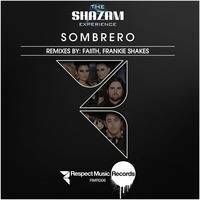 The Shazam Experience are the latest addition to the Respect Music Records Family with the release of their new single “Sombrero”. Their style of music is quite diverse covering Nu Disco and House music in all its forms (Soulful, Latino, Funky, Deep, Tribal, Progressive & Tech House). The live act has rocked dance floors across the globe with their unique funk filled shows, including performing live for MTV Europe and headlining internationally renowned Mediterranean dance festival Summer Dance (which over the years has graced the likes of Junior Jack, Kid Creme, Darren Emerson and Gabriel & Dresden, to name a few). “Sombrero” is a Latin inspired Soulful House track and it is definitely one of the highlights off Shazam’s most recent album release. With its serenading flamenco melodies and soulful vocals “Sombrero” sets the perfect soundtrack for a Caribbean Summer adventure. Definitely a track that will be a popular addition to any House DJ’s pool side sessions. Sombrero has a bit of something for everyone, as in addition to the Radio Edit, Extended Mix and Acapella DJ Tool, we also have added two very different remixes. Firstly coming from Toronto, Ontario we have DJ/Producer Frankie Shakes, delivering with his remix, an upbeat tribute to the classic sounds of house with a full vocal remix as well as a remix Instrumental for those that dig the musical journey. Secondly we have yet another fellow Canadian DJ/Producer Faiith, whom should be familiar to all the Respect Music Records fans after dropping his debut the “For Real EP” with us just last month. Faiith opted to add some diversity to the Sombrero release with a darker moodier remix for those late night sets in place of the more tropical sound he is also known for. Here is what some of the industry heads have had to say about "Sombrero"
Sharif D - "A really solid release through out.....the Original Radio Edit and the Frankie Shakes Remix are just hanging to be Summer Classics!!! Covering the cool bar sound to the club...plus it was so refreshing to hear the classical/flamenco guitar in a House track again...great execution, strong vocals and production...keep the Latin vibes coming guys"
Anthonne Boogie Shepherd - "Some great mixes for different styles of gigs"
My Soul Radio - "HOT!" BWU - "Thank u for this piece of sun & taste of summer ;-) full support"
Kiss FM Melbourne - "YES!" We hope that one, if not all of the mixes gets you moving also and we look forward to getting you more great sounds from around the world shortly.